Laguna Beach Unified School District is a K-12 public school district located in the city of Laguna Beach. Enrollment for the fall of 2018 is typically close to 2870 students. For all students, approximately 47 percent of the students are female and 53 percent are male. 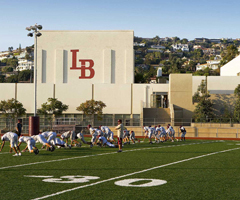 For CIF sports participation at Laguna Beach High School, approximately 47 percent of the students are female and 53 percent are male, as well. Laguna Beach High School students also participate in two additional non-CIF certified sports, surfing and dance. The participation counts and percentages are listed below.